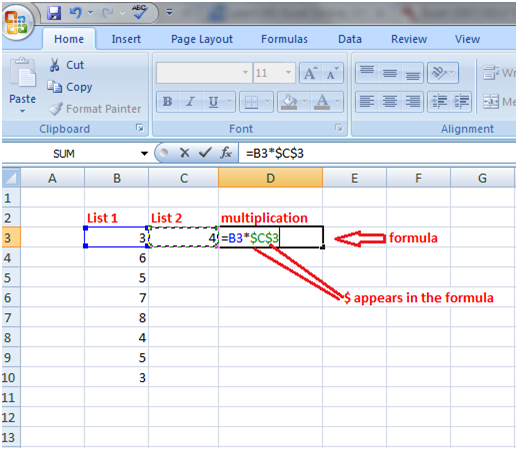 Absolute referencing helps multiply multiple values with a particular value. See the image shown below. The list 1 values are multiplied by 4, value of cell C3. In this case, we will use symbol $ in the formula. So we have to modify the formula for that after entering the formula press F4 key. $ Sign will appear in the formula. See cell D3 in the image. Then press Enter key to get the result. Now drag the fill handle from cell D3 till cell D10. All values of list 1 will get multiplied with 4. 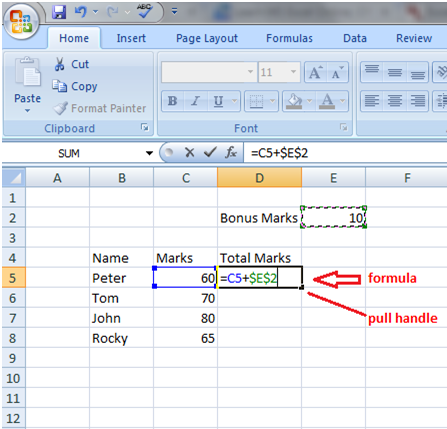 In a similar way, in the image shown below, the bonus marks are added to the marks of the students by modifying the formula from =C5+E2 to =C5+$E$2.